The Jockey Club, the largest commercial group in British horseracing, today announced plans to make its largest ever investment in racecourse facilities with the unveiling of a £45 million concept for the next stage of development at its flagship Cheltenham Racecourse. Many National Hunt fans will be suffering from a Cheltenham Festival hangover this week as the reality dawns that they must wait another 12 months before the enjoyment of the four day meeting comes round again. Bobs Worth won a thrilling renewal of the 2013 Cheltenham Gold Cup for Nicky Henderson and Barry Geraghty. With British and Irish stables 13-all going into The Festival finale, the Johnny Henderson Grand Annual Chase, it was Alderwood, trained by Tom Mullins, who broke the deadlock in favour of the raiders with a record Irish score of 14. Paul Nicholls had to wait until the penultimate race of the whole meeting but Salubrious got the champion trainer off the mark at Cheltenham in the Martin Pipe Conditional Jockeys' Handicap Hurdle. Salsify was a dramatic winner of the CGA Foxhunter Chase Challenge Cup at Cheltenham after Oscar Delta unseated Jane Mangan when leading on the run-in. Fishers Cross justifies the strong support to land the Albert Bartlett, giving Tony McCoy his first winner of the week. Tony Martin and Bryan Cooper teamed up for their second Cheltenham winner in two days when Ted Veale reeled in long-time leader Tennis Cap in the Vincent O'Brien County Hurdle. Our Conor put up a scintillating display to run away with the JCB Triumph Hurdle at Cheltenham. Solwhit arrived late on the scene to deny the Stewart family a fairytale victory with Celestial Halo in the Ladbrokes World Hurdle at Cheltenham. Cue Card made all to claim a second Cheltenham Festival success for Colin and Joe Tizzard in the Ryanair Chase. Benefficient produced a gutsy performance to land the Jewson Novices' Chase, the opening event on the third day of the Cheltenham Festival. Big Shu led home an Irish benefit in the Glenfarclas Cross Country Chase at Cheltenham for Peter Maher and jockey Barry Cash. Nigel Twiston-Davies landed his second winner of the Cheltenham Festival when Same Difference edged out Super Duty in a thrilling finish to the Fulke Walwyn Kim Muir Challenge Cup. Carrickboy made just about every yard to land the Byrne Group Plate at the Cheltenham Festival. Holywell broke a frustrating run of second place finishes where it mattered most when holding on to win the Pertemps Final at the Cheltenham Festival. Willie Mullins claimed the Weatherbys Champion Bumper for an eighth time at the Cheltenham Festival courtesy of Briar Hill. Flaxen Flare gave Ireland another winner at the Cheltenham Festival with a convincing 25-1 success in the Fred Winter Juvenile Handicap Hurdle. Medinas sprang a 33-1 surprise for jockey Wayne Hutchinson and trainer Alan King in the Coral Cup at Cheltenham. Triple Gold Cup-winning rider Jim Culloty enjoyed Festival success as a trainer when Lord Windermere took the RSA Chase at Cheltenham. The New One provided local trainer Nigel Twiston-Davies with a Festival winner when storming away to land the Neptune Investment Management Novices' Hurdle, bursting the bubble of Pont Alexandre in the process. Back In Focus put up a determined staying performance to give trainer Willie Mullins his fourth winner of this year's Cheltenham Festival in the John Oaksey National Hunt Chase. 11 horses have been declared for the Betfred Cheltenham Gold Cup, with all the main protagonists standing their ground. Hurricane Fly regained his Stan James Champion Hurdle crown with what was in the end a commanding victory at the Cheltenham Festival. 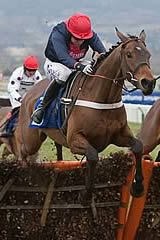 Quevega made it a remarkable five-timer in the OLBG Mares' Hurdle with a thrilling victory at the Cheltenham Festival. Sam Waley-Cohen punched out Rajdhani Express to claim a thrilling triumph in the Rewards4Racing Novices' Handicap Chase at Cheltenham. Jockey Brendan Powell jnr enjoyed his first Cheltenham Festival winner when storming to victory on Golden Chieftain in the JLT Specialty Handicap Chase. Red-hot favourite Simonsig was made to pull out all the stops to claim the Racing Post Arkle Challenge Trophy at the Cheltenham Festival. The Festival curtain raiser provided a thrilling contest with Champagne Fever winning the Supreme Novices Hurdle in the hands of Ruby Walsh ahead of My Tent Or Yours in second and Jezki third. Exciting second-season chasers Bobs Worth, Silviniaco Conti and Sir Des Champs feature among 12 six-day confirmations for the £550,000 Grade One Betfred Cheltenham Gold Cup (3.20pm), highlight of Cheltenham Gold Cup Day at The Festival, Friday, March 15. Nicky Henderson's jumping superstar Sprinter Sacre heads the 10 contenders for the £365,760 Grade One Sportingbet Queen Mother Champion Chase (3.20pm), the highlight of Ladies Day, Wednesday, March 13. Hot favourite Hurricane Fly heads 10 horses going forward for this year’s £400,000 Grade One Stan James Champion Hurdle at the six-day confirmation stage for Champion Day, Tuesday, March 12. The ultra-tough and consistent hurdler, Fair Along, will return to the forthcoming Cheltenham Festival having become a regular at the showcase event since 2006. Entries for all 27 races at The Festival are now in the public domain with the unveiling of the contenders for the Grade Two OLBG Mares' Hurdle, the Grade One Weatherbys Champion Bumper and the CGA Foxhunter Chase today. Donald McCain is confident that his star novice chaser Overturn has a good chance of toppling the red-hot favourite Simonsig in the Racing Post Arkle Challenge Trophy at Cheltenham on the opening day of the Festival, Tuesday, March 12. One of the leading Jump trainers, Nigel Twiston-Davies has an excellent record at his local track Cheltenham, with 13 victories at The Festival and 24 at The Open (since 1990). He recently achieved his 1,500th winner. A new record total of 1,145 entries was revealed today for the 11 handicaps at The Festival, with more Irish entries than ever. There are only 20 days until The Festival 2013 gets underway and the build up continues with the unveiling of the latest confirmations for the eight outstanding novices' hurdles and novices' chases run over the four days, March 12 to 15 inclusive. Rock On Ruby, winner of last season’s Stan James Champion Hurdle, continues to please his trainer, Harry Fry, as he builds up to the defence of his hurdling crown on the opening day of the next month’s Cheltenham Festival. Trainer Rebecca Curtis goes into the Cheltenham Festival hoping to build on her breakthrough success at last year's event with At Fishers Cross, the current favourite for the Albert Bartlett Novices' Hurdle. Trainer Nicky Henderson saddled a record seven winners at The Festival in 2012, taking his total successes at the meeting to 46. There is now just under four weeks until The Festival 2013 gets underway and the countdown intensifies today with the unveiling of the latest acceptors for the five Grade One championship contests following the February 12 scratchings deadline. The high-class and tremendously versatile old stager, Tidal Bay, looks increasingly likely to bid for the Grade 1 Ladbrokes World Hurdle at next month’s Cheltenham Festival, in preference to having another crack at the Betfred Cheltenham Gold Cup. Sir Des Champs became Ireland's main contender for the Betfred Cheltenham Gold Cup when outstaying Flemenstar in the Hennessy Gold Cup at Leopardstown. Champion trainer Paul Nicholls' leading Cheltenham Gold Cup contender Silviniaco Conti further cemented his position with a straightforward success in the Denman Chase at Newbury. Since riding his first winner in an amateurs’ race at Newbury in 2006, Nick Scholfield has established himself as one of Jump racing’s brightest young talents and already has three high-profile rides to look forward to at the 2013 Cheltenham Festival. My Tent Or Yours has been heavily-backed in the ante-post markets for this weekend's feature race, the Betfair Hurdle, at Newbury on Saturday but can the exciting six-year-old thrust joy back into the Nicky Henderson camp after the fatal fall of Darlan? Henry de Bromhead's chaser demonstrated that he still has plenty to offer in whichever Cheltenham Festival race connections opt for. When you think of Cheltenham trials, the Adonis Hurdle isn't one of the most obvious races to turn to for Festival clues but the two mile juvenile contest has produced a number of useful performers down the years that have gone on to Cheltenham Festival glory. Nicky Henderson's Captain Conan will attempt two and a half miles over fences for the first time on Saturday, February 2, when he lines up in the Betfred Mobile Lotto Challengers Novices' Chase at Sandown. The entries have been revealed revealed for the four championship novices’ hurdles run at the Cheltenham Festival from Tuesday, March 12, to Friday, March 15. The market for the Triumph Hurdle at the Cheltenham Festival, on Friday, March 15, is now taking shape with more juveniles having had a run, and a few more to make their debut in the coming weeks. The entries are revealed today for the four novice chases staged at The Festival from Tuesday, March 12, to Friday, March 15. The Grade 1 William Hill Supreme Novices' Hurdle is the first event on Tuesday 12th March, the opening day of the Cheltenham Festival and it promises to be an intriguing affair. Cue Card is a general 6-1 chance for the two-mile-five-furlong Ryanair Chase, his most likely target at the Cheltenham Festival. Sprinter Sacre, who recorded a scintillating victory in the Racing Post Arkle Chase at Cheltenham last year, heads 17 entries for the Sportingbet Queen Mother Champion Chase, the highlight of Ladies Day at The Festival on Wednesday, March 13. Cheltenham Racecourse has announced that the Country Gentlemen’s Association (CGA) is to sponsor the CGA Foxhunter Steeplechase at The Festival, in a five-year deal starting in 2013. Nicky Henderson has an embarrassment of equine riches on his hands at the moment with the likes of Long Run, Darla, Sprinter Sacre and Bob’s Worth, but his Simonsig will be a banker for many punters at March’s Festival. Cheltenham Racecourse will name the 2013 running of the National Hunt Chase at The Festival in honour of the late John Oaksey, who died at the age of 83 on September 5 this year. Quevega has been installed the new-ante-post favourite for the Grade 1 Ladbrokes World Hurdle with defending champion Big Buck’s out of the reckoning. There were plenty of clues on offer at Prestbury Park over the weekend for anybody looking to untangle the antepost markets ahead of the Cheltenham Festival in March as the two day International Meeting took centre stage at the Gloucestershire track. Cheltenham Racecourse has announced that Betfred has extended its sponsorship of the Betfred Cheltenham Gold Cup for a further three years, up to and including 2015. No sooner had Synchronised entered the Cheltenham Gold Cup winner’s enclosure last week when the market for next year’s race was already formed by bookmakers who placed the new champion behind three others in the betting at odds of 10/1 to win back-to-back renewals of National Hunt racing's most prestigious race. In the Gold Cup's history only seven horses have won more than once, and the most recent of them is Kauto Star in 2007 and 2009. The others were Best Mate (2002/03/04), L'Escargot (1970/71) Easter Hero (1929/30), Golden Miller (1932/33/34/35/36), Cottage Rake (1948/49/50) and Arkle (1964/65/66). All the successes were in consecutive years except for Kauto Star, the only horse to regain the title.Cheltenham Festival is one of the highlights of the English sporting year. A comprehensive overview of the Cheltenham Festival providing a wide variety of information on the event including the latest news, betting tips and odds. As in previous years, we will be operating our Return Helicopter Transfer Service direct to the Racecourse Heliport from The Frogmill Hotel, at the junction of the A40 and the A436 near Andoversford, where there is an ample Free car park.